Kan zijn, dat de ligplaats nog in Nederland is. A ship with an interesting history. In 1940 the German Wehrmacht claimed the tug as part of their war booty and used it for patrolling the canals. In 1946 it was acquired by WH de Ridder from Amsterdam and in 1949 sold to a shipping company owned by the Goedkoop brothers in Amsterdam, who in 1967 sold it to the AJ van Hurk company in Maasbracht, where it was renamed "Germa". In 1983, the W.C.M.G. van Dongen shipping company purchased the tug and later sold it to JJ Koster from Heel, who gave the ship its current name: "Liberté". 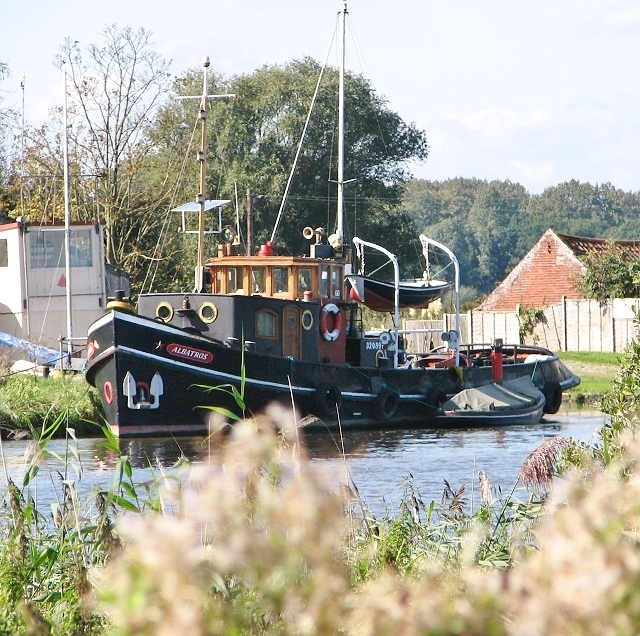 In 2006 the tug changed hands again, this time to R Noy from Beneden-Leeuwen and its present owner brought the tug from Holland to Norfolk in 2014. The "Liberté" is 18 metres long and 4 metres wide at its widest point. It has a 1 x 3 cylinder diesel engine and 180 horsepower. Update - June 2016: The tug has recently been renamed "Albatros", which is the original name it was registered under in 1938. 1 x 3 cilinder Industrie nr. 3117, type 3VD6A uit 1938 vermogen 150 apk. = 110 kW. bij 330 r.p.m. Enig idee welke boot dit is liggend in Rosslare. Er stond 1932 bij maar dat lijkt mij onwaarschijnlijk. 1944, 23 ton, 390 apk. 21,31 x 5,45 x 1,81 m.